iPad Not included with chair. Acutouch™ 9500X / HT-9500X. Welcome to the all-new AcuTouch™ 9500X Massage Chair. This beautifully designed redefinition of comfort, features and wellness takes the massage experience—and the way it's controlled—to a brilliant new level. Incorporating the very best materials, ingenuity and functionality we have to offer, the AcuTouch™ 9500X is our premier massage chair. It provides a wealth of wellness techniques, programs and features. Features Dual Lumbar Heat. NEW ACUTOUCH 9500 MASSAGE CHAIRS INCLUDE SALES TAX & INSIDE DELIVERY. $3999 - $2999 Standard Freight Shipping Included. IN STOCK! 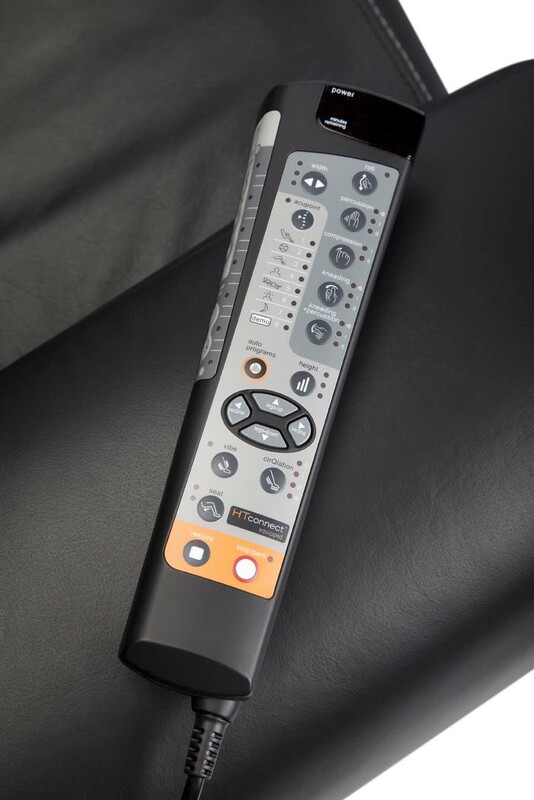 Wireless Wellness — Wirelessly control all features of the of the new AcuTouch™ 9500 Massage Chair, and connect with users, access expert resources and feel better. Espresso Shot — Point-and-push simplicity for targeted 5-minute massages. Combine up to three for a personalized massage program that satisfies your specific wishes. Personalized Effectiveness — Remembers your favorite position and everything else it learns to enhance future use. Recommended Massages — Morning, noon or night, HT-Connect™ automatically suggests the right massage for the right time of day. Custom-Created Massages — Select from an ever-growing list of massage programs created by our esteemed Wellness Council, comprised of chiropractors, doctors, professional athletes, massage therapists and more. Eight Programs - Choose from eight 15-minute auto-massage programs to suit your specific needs and desires anytime day or night. Human Touch Technology™ - Simulating the hands and techniques of expert massage therapists, Human Touch Technology™ provides a three-dimensional massage experience unlike any other. Premium Leather Upholstery - Premium Uncorrected Leather/Leather Match on back and sides. Memory Foam - Visco-Elastic Memory foam in the Seat. Dual Lumbar Heat - Soothing dual lumbar heat elements. Backrest heater panels pamper and prepare sore muscles for the most effective Human Touch robotic massage possible. Power Footrest allows you to adjust the footrest up and down at the chair base. Elevating and Extendable Robot Rotating Calf & Foot Massager footrest ottoman. Is the AcuTouch 9500X too large for you? Take a look at the new HT-5270 with Body Scan Technology. Refurbished Chairs have a 90 Day Parts Limited Warranty. Extended 5 year In-Home Human Touch Factory Warranty is Available on New and Renewed Chairs only. 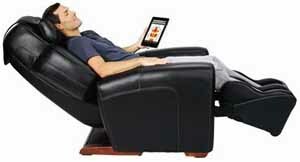 SALES TAX is INCLUDED on NEW AcuTouch 9500 Massage Chair Orders. Standard Freight Ground Curbside shipping is included on Renewed Chairs. 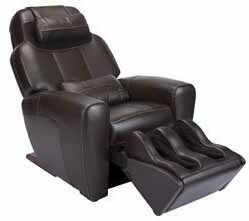 *WARRANTY INFORMATION: New and Renewed AcuTouch 9500 Elite massage chairs have a 5/3/1 Year Factory Limited Warranty. The AcuTouch 9500 massage chairs come with a manufacturer's five-year limited warranty against Structural defects (Frame only - cosmetics are not covered). Parts are covered for three years from the original date of purchase. In Home Factory Service (All 50 US states and most major cities in Canada) is covered for one year from the date of purchase and can be extended with an extended warranty. 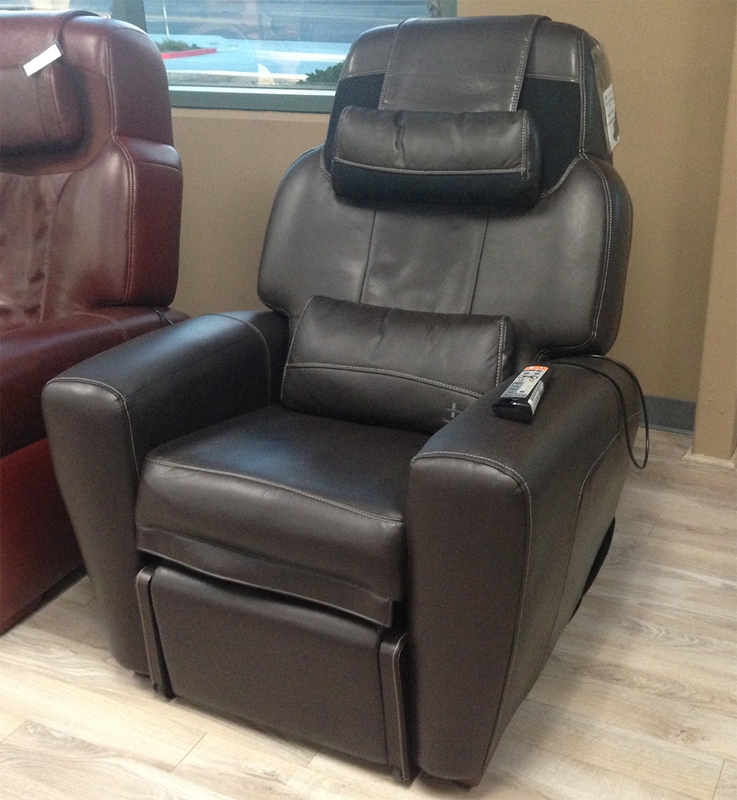 Refurbished Massage Chairs include a 90 Day Limited Parts Warranty. Chairs are packed for shipping and require minor assembly. Warranty is not valid for chairs shipped out of the United States and Canada. In-Home Service is only available in the US 50 states and most major Canadian Cities. Extended warranties are available on New and Renewed Massage Chairs only. More Warranty Information.